[0.3 points.] How did "extrasolar" giant planets in small, eccentric orbits form? (A) They were formed very close to their stars, in eccentric orbits. (B) They were formed very far from their stars, in circular orbits, but their orbits were disrupted by collisions with other protoplanets, and spiraled inwards. (C) They were formed very far from their stars, in circular orbits, but they lost angular momentum to the protoplanetary disk, and spiraled inwards. (D) They were produced by material ejected from a collision between two stars. Correct answer: not revealed yet (see discussion below). The students in section 4160 chose impacts on protoplanets (response (B)) over the correct response (C) of (gradual) angular momentum redistribution, after a discussion earlier in the same lecture about angular momentum transfer from the young Sun to its nebular disk. This prompted a refresher on this same subject immediately afterwards. In section 5166, after showing the lack of consensus in their replies, students were asked to discuss their responses with each other before responding again, with a moderate shift towards the correct answer. "Poetry uses the hub of a torque converter for a jello mold." "The lazy manage to keep up with the earth’s rotation just as well as the industrious." To live again as butterfly." --Christina Georgina Rossetti, "The Caterpillar (Sing-Song)"
"Let the great world spin for ever down the ringing grooves of change." "Your work is to keep cranking the flywheel that turns the gears that spin the belt in the engine of belief that keeps you and your desk in midair." [20 points.] A Physics 5A student is going to drive a 15,000 kg flat-bed truck at constant speed up a hill that makes a certain angle with respect to the horizontal direction. A 40.0 kg package sits in the back of the truck. The coefficient of static friction between the package and the truck is 0.310. What is the maximum angle of the hill that the truck can travel up at constant speed without the package falling off of the back? Neglect air resistance. Show your work and explain your reasoning. Correct. Draws free-body diagram for _only_ the package with tilted axes, with the weight force broken up into w_x = m*g*cos(theta) and w_y = m*g*sin(theta) components. 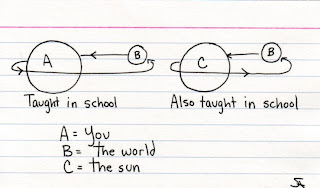 Newton's first law is applied in _both_ x- and y- directions. For the y-direction, Newton's first law gives N = w_y = m*g*cos(theta), and for the y-direction, Newton's first law gives f_s = w_x, or mu_s*N = m*g*sin(theta). Solving for and substituting in for N allows theta to be solved for, resulting in theta = Arctan(mu_s). Nearly correct, but includes minor math errors. Typically uses N = m*g, but otherwise has f_s = m*g*sin(theta), but otherwise shows complete systematic FBD -> Newton's laws -> algebra approach. Nearly correct, but approach has conceptual errors, and/or major/compounded math errors. Free-body diagrams, application of Newton's laws, and algebra are problematic, but still demonstrates some application of this systematic approach. Implementation of right ideas, but in an inconsistent, incomplete, or unorganized manner. Some attempt at a free-body diagram, applying Newton's laws, or algebra. [10 points.] An SUV collides with a Mini Cooper convertible (of much smaller mass). No one is hurt in this accident. During the collision, is the force exerted on the Mini by the SUV greater than, equal to, or less than the force exerted on the SUV by the Mini? Explain your reasoning using the properties of forces and of Newton's laws. Correct. According to Newton's third law, the two contact (normal) forces involving the SUV and the car have the same magnitude (but have opposite directions), regardless of their different masses. As (p), but argument indirectly, weakly, or only by definition supports the statement to be proven, or has minor inconsistencies or loopholes. E.g., recognizes that the two forces have the same magnitude, but has garbled application of Newton's third law, or recognizes applicability of Newton's third law, but does not realize that the two forces have the same magnitude. Nearly correct, but argument has conceptual errors, or is incomplete. May state that the forces have the same magnitude, but due to reasons other Newton's third law. Limited relevant discussion of supporting evidence of at least some merit, but in an inconsistent or unclear manner. E.g., does not recognize that the two forces have the same magnitude, but still attempts to apply Newton's laws in some manner. Could the distance traveled and the magnitude of displacement be different when describing the same motion of an object? Explain your reasoning using an example and discussion of the properties of position, distance traveled, and displacement. Correct. Draws a diagram and/or makes a convincing argument that demonstrates that the distance traveled is the "actual winding path" taken from a start position to a finish position, while the magnitude of displacement is the "straight line distance" from start to finish, and can be quite different if an object makes a non-linear trajectory. As (p), but argument indirectly, weakly, or only by definition supports the statement to be proven, or has minor inconsistencies or loopholes. May have some ambiguity concerning displacement or magnitude of displacement, but otherwise makes correct distinction between distance traveled and displacement (magnitude) using an example. Nearly correct, but argument has conceptual errors, or is incomplete. Argument mainly based on difference between a scalar and a vector property, i.e., comparison of distance traveled and displacement (as opposed to displacement magnitude). Limited relevant discussion of supporting evidence of at least some merit, but in an inconsistent or unclear manner. May involve velocities, forces, and/or net forces. [15 points.] Discuss the evidence that supports the theory that most of the meteorites found on the surface of the Earth are recent fragments of asteroids. exposed surfaces of asteroids induce radioactive decays. The degree of cosmic ray induced decay products corresponds to amount of time spent exposed to outer space. Since meteorites do not have much of this "space tan," they could not have been exposed to outer space for very long, and thus could only have recently fragmented off from deep within larger asteroids. Contains right ideas, but discussion is unclear/incomplete or contains major errors. May confuse the decay products due to cosmic ray exposure with those that determine the solidification age of a material. Limited relevant discussion of supporting evidence of at least some merit, but in an inconsistent or unclear manner. Typically argues that a meteorite found on the Earth (which is continuously renewed/resurfaced) must haven been deposited there recently, while not accounting for the possibility that the meteoroid may have broken off of its parent asteroid a long time ago, and spent much of its time until now drifiting through space. [15 points.] Explain why the meteors in a given shower would appear to be diverging from a fixed point in the sky, as seen from San Luis Obispo, CA. Correct. Describes and explains the "showerhead effect," where the parallel paths of comet debris particles appear to diverge away from a fixed point in the sky as the Earth passes through the debris. Nearly correct (explanation weak, unclear or only nearly complete); includes extraneous/tangential information; or has minor errors. Typically describes, but does not fully explain the showerhead effect. Contains right ideas, but discussion is unclear/incomplete or contains major errors. Solidification age is reset, but due to loss/gain/renewal of unstable isotopes. why they would appear to diverge from a fixed point in the sky. [3.0 points.] Which one of the following choices best explains why stony-iron meteorites are the least abundant of the asteroid-source meteorites found on the surface of the Earth? (A) They are debris from planetesimal bombardments of the Moon, or Mars, that somehow traveled through space and entered the atmosphere of the Earth. (B) They are not dense enough to adequately survive entering the atmosphere of the Earth. (C) They only come from the cores of large asteroids. (D) They only come from the outermost part of large asteroids. (E) They only come from a thin boundary layer within large asteroids. [3.0 points.] 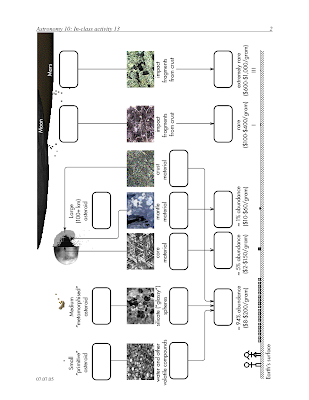 Which one of the following choices best describes what made the large iron crystals found in iron meteorites? (A) Rapid cooling as liquid droplets sprayed outward during impacts between early solar system bodies. (B) Heat generated by impacts by asteroids on other terrestrial planets. (C) Heat generated from passing through the Earth's atmosphere as a meteor. (D) Heat generated from frequent collisions between asteroids and asteroid fragments. (E) Very gradual cooling in the interiors of large asteroids. The interiors of large asteroids would have taken longer to cool off than smaller asteroids (The Turkey/Cornish Hen Effect), such that the iron cores of the large asteroids would have cooled gradually enough for the iron atoms to assemble themselves into an orderly fashion, forming large crystalline domains. "The one good thing about repeating your mistakes is that you know when to cringe." Why can't I make a mistake?" "Men are more apt to be mistaken in their generalizations than in their particular observations." "Truth comes out of error more easily than out of confusion." "The proper method for hastening the decay of error is...by teaching every man to think for himself." "Astrophysicists are often in error, but never in doubt." "When you make one wrong turn, the errors tend to compound." Err and err and err again but less and less and less." Correct. Earth has oceans and tectonic plate motion, while Venus and Mars do not. CO_2 in the Earth's atmosphere is absorbed by the oceans, then is incorporated into sedimentary rock on the ocean floor, which is then subducted back into the mantle. Nearly correct (explanation weak, unclear or only nearly complete); includes extraneous/tangential information; or has minor errors. Recognizes importance of oceans or tectonic plate motion, but does not explicitly describe both. Or as (p), but also cites less CO_2 released by volcanos relative to Venus and/or Mars as contributing factor. Contains right ideas, but discussion is unclear/incomplete or contains major errors. At least recognizes that CO_2 is somehow being cycled out of the atmosphere back into the mantle. Limited relevant discussion of supporting evidence of at least some merit, but in an inconsistent or unclear manner. Appeals to plant life, greenhouse effect, or attaining escape velocity as the primary removers of CO_2 from the atmosphere. A rock sample with an extremely old solidification age (as determined by radioactive dating) is heated until it is molten, and then cooled back down to a solid. Discuss what happens to its solidification age, and explain why this happens. Correct. The solidification age of a rock is determined by comparing the amount of gaseous decay products to the amount of unstable radioactive isotopes in the sample; a higher ratio of gaseous products to unstable isotopes corresponds to a sample that had solidified a long time ago. Heating the rock until molten would release the gaseous decay products, such that when it cools back down to a solid, it would have nothing to compare to the unstable isotopes that remain in the sample, effectively giving it a zero solidification age. Nearly correct (explanation weak, unclear or only nearly complete); includes extraneous/tangential information; or has minor errors. Recognizes that during melting, the amount of decay products in the sample somehow goes to zero, or is transmuted, thus "resetting" the solidification age to zero when it cools and solidifies. A sample "x" response (from student 3635), with credit given for effort, rather than merit. 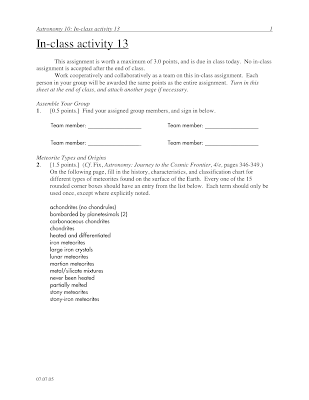 Students find their assigned groups of three to four students, and work cooperatively on an in-class activity worksheet detailing the types and origins of meteorites. Students are instructed to look for connections and similarities, then to concentrate on specific differences. 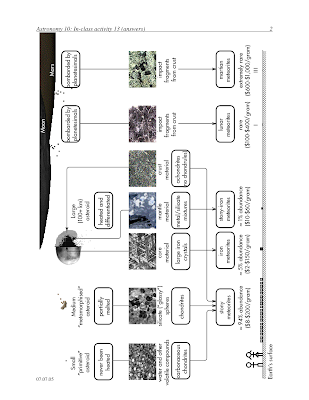 In-depth analysis questions on meteorite types and origins follow on the third page. 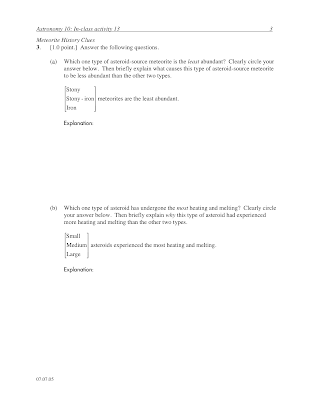 The answers for the second page are shown below. 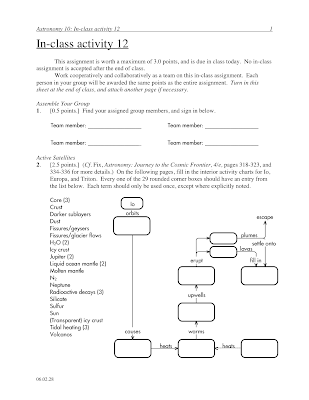 Students find their assigned groups of three to four students, and work cooperatively on an in-class activity worksheet comparing the active geo- or hydrological processes of Io, Europa, and Triton. Students are instructed to look for patterns and entries used more than once (e.g. "tidal heating"), then to concentrate on specific differences. The answers for each satellite are shown below. [3.0 points.] 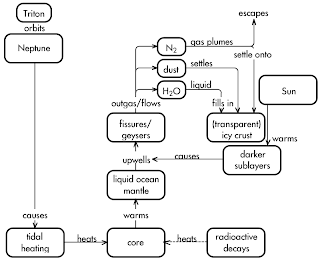 Which one of the following choices best explains how carbon dioxide (CO_2) molecules caused the recent evolution of Mars to diverge from that of the Earth? (A) CO_2 from the atmosphere was removed without being replaced, causing Mars' atmosphere to become thinner and colder. (B) More CO_2 was released into the atmosphere than could be recycled, causing Mars' atmosphere to become thinner and colder. (C) CO_2 was removed from the atmosphere without being replaced, causing Mars' atmosphere to become thicker and hotter. (D) Too much CO_2 was released into the atmosphere, causing Mars' atmosphere to become thicker and hotter. (E) More CO_2 was released into the atmosphere than could be recycled, causing Mars' atmosphere to become thicker and hotter. "Never work on a problem for which you do not have an unfair advantage." "I don't see why you are talking about this problem when either of you is capable of sitting down and solving it." "The real problem is what to do with the problem solvers after the problems have been solved." "Your problem is never really your problem, your reaction to your problem is your problem." "I don't understand complicated problems. I only understand simple ones." "For every problem there is a solution which is simple, clean and wrong." "If you can talk brilliantly about a problem, it can create the consoling illusion that it has ben mastered." "When you suddenly see the problem, something happens--you have the answer before you are able to put it into words. It is all done subconsciously. THis has happened too many times to me, and I know when to take it seriously. I'm so absolutely sure. I don't talk about it, I don't have to tell anybody about it, I'm just sure this is it." "If the only tool you have for measuring value is a quarterly financial report or a price tag, then everything that is excluded from that report or that comes without a price tag begins to look like it has no value." "When there is no solution, there is no problem." "Every problem has in it the seeds of its own solution. If you don't have any problems you don't get any seeds." "Inside every large problem is a small problem struggling to get out." "I don't want to be immortal through my work. I want to be immortal through not dying." "Anyone can do any amount of work, provided it isn't the work he's supposed to be doing at that moment." "You will know your enemies because they're the ones that interfere with the work." "My life had such potential, she told me, before I found out how much work was involved." [3.0 points.] 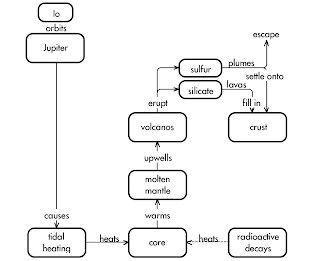 Which one of the following choices best explains how carbon dioxide (CO_2) molecules caused the recent evolution of Venus atmosphere to diverge from that of the Earth? (A) CO_2 from the atmosphere was removed without being replaced, causing Venus' atmosphere to become thinner and colder. (B) More CO_2 was released into the atmosphere than could be recycled, causing Venus' atmosphere to become thinner and colder. (C) CO_2 was removed from the atmosphere without being replaced, causing Venus' atmosphere to become thicker and hotter. (D) Too much CO_2 was released into the atmosphere, causing Venus' atmosphere to become thicker and hotter. (E) More CO_2 was released into the atmosphere than could be recycled, causing Venus' atmosphere to become thicker and hotter. [3.0 points.] A 75.0 kg box is sliding down a ramp at a constant velocity. The ramp makes an angle of 15.0 degrees above the horizontal direction. Which one of the following forces has the greatest magnitude? (A) Kinetic friction force on the box. (B) Weight of the box. (C) Normal force of the ramp on the box. The weight of the box has a magnitude m*g = 735 N. Since it is sliding down the ramp at constant speed (along a constant direction), then Newton's first law applies, which means that the forces acting on the book must sum to zero, according to the Newton's law flowcharts. This means that the (tilted) x-component of the weight force is equal and opposite to the kinetic friction force, thus f_k = m*g*sin(15.0 degrees) = 190 N. The (tilted) y-component of the weight force is equal and opposite to the normal force, thus N = m*g*cos(15.0 degrees) = 710 N.
[3.0 points.] A 4.0 kg book is horizontally pulled by a string at constant speed along a horizontal table. The coefficient of kinetic friction is 0.35. What is the magnitude of the net force acting on the book? 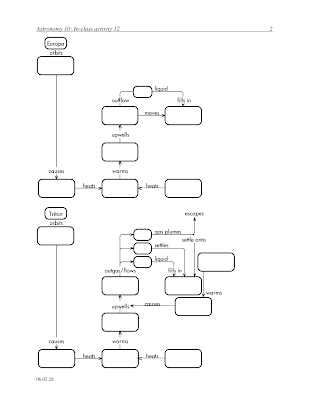 Since the book is dragged at constant speed (along a constant direction), then Newton's first law applies, which means that the forces acting on the book must sum to zero, according to the Newton's law flowcharts. Response (B) is the kinetic friction force f_k = mu_k*m*g; response (D) is the magnitude of either the weight or the normal force (w = mg or N). Response (B) is the difference between the magnitudes of weight (or normal force) and the kinetic friction force (m*g - mu_k*m*g), which are respectively along vertical and horizontal directions. [3.0 points.] A ball is thrown with an initial velocity of 24.0 m/s at an angle of 30.0 degrees above the horizontal. What is the ball's highest point in its trajectory, as measured from above its launching point? Response (A) is -v_i*sin(30.0 degrees)/(2*a_y); response (C) is -(v_i*sin(30.0 degrees))^2/a_y (the modal response, with the factor of 2 dropped); while response (D) is 2*v_i*sin(30.0 degrees). "I know this defies the law of gravity, but, you see, I never studied law." "You may hate gravity, but gravity doesn't care." "Gravity is a habit that is hard to shake off." "It is a mathematical fact that the casting of this pebble from my hand alters the centre of gravity of the universe. "Challenges are gifts that force us to search for a new center of gravity. Don't fight them. Just find a different way to stand." "Gravity is a contributing factor in nearly 73 percent of all accidents involving falling objects." [3.0 points.] Which one of the following choices best describes the main source of carbon dioxide (CO_2) molecules in the Earth's atmosphere? (C) Global warming produced by modern industry. Volcanos are the main source of carbon dioxide in the atmosphere. Modern industry manages to take the carbon dioxide that was sequestered from the atmosphere by plants, and recycle it back into the atmosphere. Ultimately, oceans absorb and convert atmosphere carbon dioxide into sedimentary rock, which is then subducted into the mantle by tectonic plate motion. [3.0 points.] 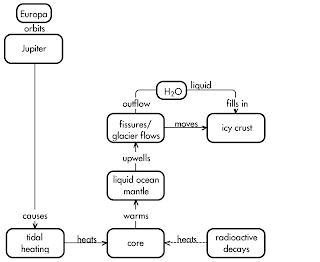 Which one of the following choices best describes what prevents too much carbon dioxide (CO_2) molecules from building up in the Earth's atmosphere? (A) Large amounts of dry ice produced for modern industry. (B) Global warming produced by modern industry. Oceans absorb carbon dioxide from the atmosphere, which then settles down and is incorporated into carbonaceous sedimentary rock. This sequestered carbon then is ultimately taken back down into the mantle at subduction trenches. [3.0 points.] Which one of the following statements best explains why atoms and molecules are able to escape from the exosphere, but would be unable to escape from the lower atmosphere of a planet? (A) Atoms and molecules are more massive in the lower atmosphere. (B) Atoms and molecules move faster in the lower atmosphere. (C) Atoms and molecules are more likely to encounter collisions in the lower atmosphere. (D) Atoms and molecules have a higher temperature in the lower atmosphere. The average speed of a molecule/atom in the atmosphere depends on the mass of the molecule/atom, and on the temperature. If this speed is greater than approximately one-sixth of the escape velocity of a planet (which depends on the mass of the planet), then the atmosphere will eventually leak out over several billion years. However, molecules/atoms may only escape from the exosphere (the upper atmosphere); no matter how fast their average speed is in the lower level, frequent collisions there prevent escape into space. This is the "mosh pit effect"--you can't leave the mosh pit if you are in the middle of the moshers, but once you can make your way to the edge, escape is possible (provided you don't get pulled back in). I. Craters partially filled in with flat lava plains. II. Craters on top of flat lava plains. After showing the lack of consensus in their replies, students were asked to discuss their responses with each other before responding again. It is easiest to start with the flat lava plains for comparison, which represent the lunar maria. The craters on top of the flat lava plains are newer than the maria, while the craters partially filled in with lava are older than the maria. Students did not successfully attain the correct answer after conferring with each other. Note that response (D) gained the most from pre- to post-discussion, interestingly enough. It certainly does seem that way in the classroom, sometimes.